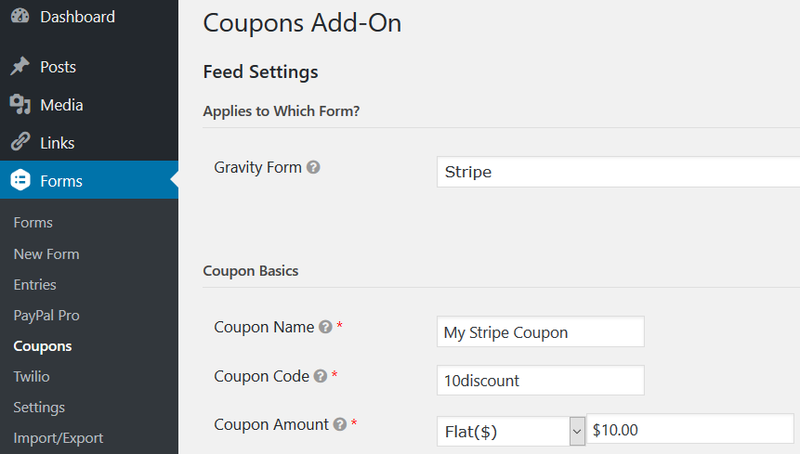 Gravity Forms has a Stripe add-on that allows you to charge your users at form submission using your Stripe.com account, but this add-on doesn’t support (currently) coupons created at your Stripe account. Gravity Forms has a also its own Coupons add-on. Using this add-on you can create a workaround for the mentioned limitation of the Stripe add-on. Basically we’re going to use the coupon at Stripe.com, a coupon created in the Gravity Forms Coupons add-on with the same name and discount, and a little snippet of code. Simply follow the steps below. Go to Forms -> Coupons menu and create your coupon. If you already have the coupon created at your Stripe.com account make sure you use in the Coupon Code field the same value you used in ID (Code) at your Stripe.com account. Obviously you will want to add a Coupon field to your form to allow the user enter the coupon code before submitting the form. 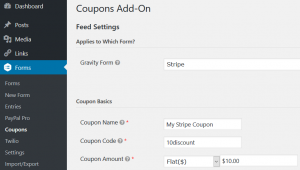 If you already have the coupon created in your Stripe.com account you can skip this step, if not, go to Subscriptions -> Coupons in your Stripe.com and create the coupon. How the discount is going to be applied to your subscription at Stripe.com is determined by this coupon setup. For example, if you want the discount to be applied only to the first payment, you will want to select “Once” in the Duration setting as shown in the screenshot. Make sure to use in ID (Code) the same value you used in Coupon Code field in Gravity Forms. If you’re not using the form total as payment amount in your feed, you can skip this step. So you need a field in your form containing the total amount before the discount, an easy solution for this would be to use the Subtotal field provided by the Gravity Perks eCommerce Fields add-on. Or you could also create a number field, set to currency type, with calculation enabled and create your own formula to calculate the total. If you did all steps above as explained, now the Gravity Forms Coupons add-on will apply the discount to your form and entry. Then the original amount for the Total field, without the discount, will be passed to Stripe.com and there the Stripe coupon will be applied. By the way, note that although we’re using the above snippet to pass the form total without a discount to Stripe.com in this use case, you can use the snippet also to alter the payment amount passed to any other payment add-on based on the Add-on Framework. But it’s not clear to me where you send the Gform coupon to Stripe. Is it automatically added to the payment request by the Gform Stripe add-on? What if I have a custom Stripe coupon which gives a 100% discount for the first 4 months of a subscription and then continues at the regular rate for the balance of 12 months? Does the 10 need to be changed to the form ID #? What about the 4? Don’t touch those values, read the comment in the snippet for how to change the form id.